The Owners　Meeting of Nippon Professional Baseball (NPB) and General Meeting of NPB met in Tokyo on November 21 and unanimously agreed to elect Tsukasa Imamura (54) as President of NPB Enterprise Co., Ltd. with terms of January 1, 2015 to the 4th World Baseball Classic (WBC) in 2017. Imamura, after graduating from The University of Tokyo, joined Nippon Television Network Corporation（NTV）in 1983 and have been instrumental in the production of a large number of the NTV’s popular programs from drama series, variety show “THE TETSUWAN DASH” to baseball broadcast. At the press conference, Imamura said that “Baseball is the most popular sport in Japan. NPB, a non-profit public entity, set up a business corporation “NPB Enterprise” on November 7 to conduct commercial aspects of Samurai Japan. 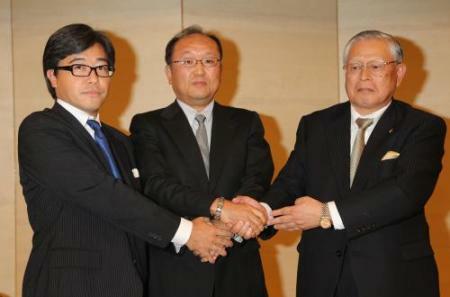 Its president Katsuhiko Kumazaki will be taken over by Imamura on January 1, 2014. Masayuki Naito, Executive Director of Baseball Federation of Japan acts as adviser of the company to keep close contacts between professionals and amateurs. The first business for NPB Enterprise attracted 20,346 paid attendance at Yahuoku Dome, the home of Fukuoka SoftBank Hawks for an exhibition game between Samurai Japan and joint Hawks/Fighters team on November 10.